Chinese monk Han-shan (the English translation of which is Cold Mountain) was a recluse and, by all surviving accounts, a rascal. Han-shan, whose given name remains unknown, lived, according to scholarly estimates, between the late sixth and the early ninth centuries...most likely. At some point during his adult life he had a wife and son….probably. How the family separated, as they most certainly must have for the following legend to have played out, is a mystery equal to every other element of the man’s life. Scholars even disagree, in fact, on the appropriate presentation of his name: Han-shan, Han Shan, etc. The one detail of Han-shan’s life that is beyond reproof are the more than 300 poems composed on cave walls on the mountain from which Han-shan drew his name. The poems are nearly always attributed to Han-shan who lived for lengthy stretches over several decades upon the same secluded mountain. The cave’s walls are covered, as are the trunks of surrounding trees, with poems about the mountain itself—its vistas, its seasonal changes, its inhabitants (none human but the poet himself)—and, though a recluse, episodes involving his life before the mountain and his dealings during infrequent sojourns to nearby towns and temples. In short, the bulk of these more than 300 poems deal in simple observation, natural or social, but are able to transcend their mundane facts, quietly blossoming into spiritual truths. For this reason, and the attractiveness of overall biographical mystery, countless poets, scholars, misfits and Zen practitioners today count themselves amongst the devoted. Countless translations of these poems have ornamented bookshelves since the 1950s, some merely fragments while others are entire catalogs of the 300 plus Cold Mountain poems. Many readers’ first exposure to the name Han-shan was thanks to Jack Kerouac, whose 1958 novel, The Dharma Bums, is dedicated to the recluse monk. Later printings of Gary Snyder’s first book, Riprap, including translations of twenty-four Cold Mountain poems. These twenty-four, though not the first time Han-shan’s work had been translated into English, were the first time his work had appeared lumped in with a popular collection of poetry and, as such, provided most readers’ first, serious glimpse at what the Cold Mountain poems were all about. A few translations aside from Snyder’s include those of Burton Watson, whose Cold Mountain: 100 Poems by the T’ang poet Han-shan (1962), is often regarded as Han-shan’s first EN MASSE scholarly translations into English; and one of the more recent bulk additions, Cold Mountain Poems (2009), translated and edited by J. P. Seaton. Special attention should also be credited to Arthur Waley, whose “27 Poems by Han-shan” appeared in Encounter in September of 1954, perhaps touching off the powder keg of subsequent of translations ever since. The aforementioned translations — those by Snyder, Burton, Seaton and Waley — are the nucleus of this essay, which will attempt to display and discuss one specific Han-shan poem, of four total, chosen for translation by each. Red Pine, whose The Collected Songs of Cold Mountain (2000) compiles all of the more than 300 Cold Mountain poems, attempts a word-for-word translation without embellishment or frill. What Red Pine provides is, perhaps, as close to the original as an English translation can get. Because of this purity, Red Pine’s translation will serve as a foundation upon which an analysis of the other four translation (below) can be built. This, we are to believe, is the precise English equivalent of what Red Pine found written on the cave walls, without embellishment: no punctuation, eight lines, adjectives and adverbs perhaps implied, but none physically present. But is a direct translation like this one actually a poem? Each translator’s contribution is unique, and in accordance with his own agenda and voice, he has attempted to create art (discerning implied meaning, attitude and perspective) by taking Han-shan’s words and applying them to research based on Han-shan, his time and place, and conducting a secondary translation that attempts to make such poetry palatable to contemporary Americans readers. (Please forgive the male pronoun, him, but the sample presented here is representative of the body of work available, which is overwhelmingly male.) The specific agenda and voice of each translation, presented here in chronological order, proves enlightening when the poems in question are presented together. Despite the many similarities inevitable in translations drawn from the same source poem, the four translators included here take an amazingly varied approach to recreating not only the poem, but also the poet. This concept — recreating the poet himself — is of utmost importance in analyzing the translations. Most of those drawn to Han-shan and his work, consciously or otherwise, consider the man and the man of legend to be of equal importance to the poems themselves. While not unique, this type of reverence is, at least, rare. We must, then, contemplate not only the translation but also the spirit of which the translation were born. What, we must ask, is so appealing about Han-shan and his work, and how has that shaped the translations? Arthur Waley viewed the source material through an academic lens. A scholar of ancient Chinese literature and translation who scooped the poetry world by first rendering Han-shan’s work in English, Waley’s method is calm and complete. Without any precedent, Waley found and translated Han-shan’s work through the western methods of which he was accustomed. Though attempting to give an accurate portrayal of the poems he was translating, Waley also sought to smooth the rough edges, adding punctuation where necessary and producing elegant sentences that, though drawn from a centuries-old Chinese source, would easily fit the western academic aesthetic. There is no path that goes all the way. Far into the morning the mists gather thick. How, you may ask, did I manage to get here? My heart is not like your heart. You too would be living where I live now. Contemplate the final two lines: “If only your heart were like mine/ You too would be living where I live now (lines 7-8). This payoff, as it were, would be more witty, more poignant and maybe more acerbic, depending on your reading, were it rendered in fewer words. But it wouldn’t necessary be, if efforts were made to make it more conversational, as complete or as in accordance with formal grammar and syntax. Waley, then, attempts to address meaning without much thought for tone. The opening lines illustrate a similar point. Waley writes, “I am sometimes asked the way to the Cold Mountain;/ There is no path that goes all the way” (1-2). Why not dispense with the colon, subsequently beginning the second line with “but?” One need look at the end of every line in the translation but one to find a possible answer. Each line ending, with the exception of line seven, is punctuated with a relatively hard stop. Punctuating each line ending is a formal gesture that places Waley firmly with the academy and, at the risk of sounding even more judgmental, firmly on the far side or World War II. Waley has not only observed the formality of punctuating each line ending (and capitalized each beginning), but he has also taken pains to use the right punctuation to do so. Dispensing with the semi colon at the end of the first line and inserting “but” at the beginning of the second would still allow for punctuation — a comma would slip nicely into the semi colon’s place — but each of Waley’s punctuated line endings is punctuated with a much more solid, insurmountable stop — semi colons, period and a question mark — than a comma can provide. But what does a semi colon have to do with a several hundred year old poem written on a cave wall? While recognition that Waley has taken pains to observe the niceties of punctuation is particularly telling, a look at line length also sheds light on his approach. Where possible Waley has made efforts, or so it seems, to create lines of comparable length except where it is advantageous to deviate. Lines six is the shortest of the eight. The same line is, by no coincidence, the turn. Waley made no effort, as hid did in the preceding seven lines, to artificially formalize the language, instead opting to set this particular line apart, both syllabically and rhetorically, as the fulcrum upon which the following two lines, what I called earlier the payoff, are hinged. Waley discerned, despite the great cultural and spatial distance between Han-shan and the western poetic tradition, the linguistic similarities that might allow his translations to apply formal western structures on seemingly informal eastern poems. I’ve used in my assessment of Waley’s translation #VI, loaded terms like academic, erudite, and formal. I stand by these labels and yet I must also mention that, however formal, Waley’s poem can also be particularly exhilarating. Waley’s line four, as just one example, uses a shift in syntax to render the language palpable. Waley writes, “Far into the morning the mists gather thick.” Forcing the reader to linger on the one syllable, two digraphs word stops them (with help from the following period), swelling their tongues and making that fog thicken in their mouth and mind’s eye. The mist is further animated by the fact that, while an adjective, it falls after the verb, thereby almost modifying it instead of the noun. It’s the joined mist that is thick, not the method in which the mist gathers. Yet the gathering — the very act itself — given this partial reshuffling in syntax, becomes thick, rendering the mist itself an active participant in its own conglomeration. The adjective becomes so inextricable from the verb that the reader begins to feel the phantom pain where the –ly ought to be. Gary Snyder’s translation employs the conversational approach that is so audibly absent from that of Waley. Snyder’s diction and syntax highlight his rejection of formality and his acceptance of common parlance as fit lifeblood of literature. Whereas Waley’s lines were even, calming and regulated, Snyder’s are wholly unpredictable; each line presents a different rhythm and unaffiliated voice. The first example in the poem of Snyder unpredictability is the hard caesura of line two: “Cold Mountain: there’s no through trail.” Snyder’s line one is similar to Waley’s, though less wordy, but the colon after the mountain name takes any momentum the reader might have built and, in no uncertain terms, crushes it. Snyder’s translation does not allow for rhythmic complacence. Snyder’s refusal to let the reader grow comfortable does not mean that the translation is free of elegant language. Only that the elegance is also impossible to predict, which makes it just as unaccommodating as any other line. In line six, for example, Snyder allows for the expansion of the poems rhythmic scope. Snyder writes, “The rising sun blurs in swirling fog.” Another, more stark approach might include dispensing with the initial determiner, but this line stands out as being particularly poetic in a poem that largely defies such genteel classification. Though not vernacular exactly, another way Snyder distances himself from the academy is by employing certain simple unpoetic or common diction. Snyder’s speaker asks, “How did I make it?” (5). Compare Snyder’s “make it” with Waley’s “How, you may ask, did I manage to get here?” (5). “Make it” seems particularly inelegant, yet the reader knows, in context, precisely what “it” means, because it means precisely what it says. This colloquial treatment of the poem’s turn is mirrored by a companion phrase in line eight. Snyder writes, “If your heart was like mine/ You’d get it and be right here” (7-8). “Get it” works, more or less, on the same level as “make it.” Both are overt attempts to both celebrate common speech and simultaneously thumb one’s nose at formality. The two concepts are not mutually exclusive nor are they inextricable. One can be employed without the other but, when taken in the same dose, the effect is greatly heightened. Whereas Snyder’s inclusion of “make it” and “get it” mimic the way most people might express the concept (and do so successfully) the location of these phrases, in the turn and the payoff, render the usage a vast departure from literary tradition. To call this type of language solely a social or stylistic choice would be inaccurate. Snyder, sensing a kindred spirit, was attempting to recreate Han-shan, not just his work, on the page. Would a miserably poor, mountaineering, recluse monk speak with perfect and elegent diction? Snyder, apparently, think’s not. I refer to Waley as representative of a poetic that would be more at home prior to the Second World War. Snyder, too, can be just as easily fixed in time. Coming of age in an era when the world was shrinking (World Wars tend to have that effect), Snyder directly benefited from the influx of alternative artistic influences, especially literary, that spilled in. Or, perhaps it would be more accurate to say that many Americans spilled out, traveling specifically to Europe and Asia, and being confronted with poetry the likes of which they never dreamed existed. Snyder was among their numbers, finding Buddhism and finding Han-shan, though not necessarily in that order. Snyder, a thoroughly documented Beat poet and spiritual mentor, became “the rebel model for American youth from the late 1950s to 1970s” (Tan 4), co-opting the Han-shan image and refracting it through the lens of American counterculture. In short, there’s a lot of Han-shan in Kerouac’s Sal Paradise. Burton Watson, on the other hand, followed Waley’s lead, creating translations that attempt to retain meaning. What sets Watson’s translations apart, among other things, is that he did them in bulk. Translating 100 Cold Mountain poems in his Cold Mountain: 100 Poems by the T’ang poet Han-shan, Watson might have had the same basic approach as Waley, but Watson made choices that render his translations unique. Watson’s translation #82 is able to achieve the basic word-for-word, funneling it into western formalities approach while infusing his translation with new meanings and unexpected diction. A prime example of Watson’s surprise content is, “How can you hope to get their by aping me?” (5). None of the other translators sampled here go so far out on a limb in translating this line. Though the language isn’t, by and large, dazzling, by shifting the rhetorical structure (line5) and including the slang, “aping,” Watson is able to revitalize a translation that, otherwise, is a bit flat. “Aping” is perhaps more appropriate than this one poem alone can show. As a character, Han-shan is often represented as playful and pure, comical yet wise in the face of hypocrisy. Han-shan’s sense of humor, on display throughout a large chunk of his more than 300 poems, has as much to do with a primate as it does, sometimes, the world of men. Let alone the fact that he lived solitary in a mountain cave for lengthy stretches throughout his life and that in China he is often represented as a spirit particularly representative of the natural world, the poems themselves, and first-hand accounts of encounters with the recluse monk, show a personae both innocent and inquisitive, energetic and a bit of a nuisance. Han-shan encompassed, then, attributes that, at least in relation to his fellow monks who would never dream of leaving the safety and relative comfort of the temple or the town, the characteristics of a wild primate. Today we laugh with and not at Han-shan, who was supposedly two steps ahead of his brethren, spiritually speaking. “Aping,” then, might take on the opposite meaning. If the other monks are the ones truly misguided, then any attempt they make, until they’ve gotten their spiritual house in order, are doomed to appear foolish to Han-shan who, having already figured it all out, can sit back and laugh at the monkeys who blunderingly imitate a superior being. Han-shan truly was as singular, perhaps, as a person can be, but he was also a man of the world who measured himself, in part, by others’ perception of him. Like anyone else, Han-shan suffered when judged harshly, was lonely at times, and felt the burden of age increasingly encompass him. Han-shan carried on conversations in his poem about these same issue, despite the fact that no one was around to read or hear. Yet, at the heart of almost all the work there is the distinct feeling that Han-shan is addressing an unnamed someone, some audience or recipient of his wisdom, both common and revelatory. Part of this feeling stems from Han-shan’s use of “you” and “your,” but this is overly simplistic as each of the translations also uses second person. This voiceless receptacle in which Han-shan poured the workings of his mind, some faceless auditor, is as much a character as the speaker himself. Burton Watson introduces the auditor a bit more than do previous translators. The question in line five feels far less rhetorical, implying not only the auditor’s existence, but also a complicit and active role in Han-shan’s discourse. Han-shan was a recluse and mystic, yes, but his mountain, however isolated, was no island. Perhaps what first stands out in J. P. Seaton’s translation is the even, complete lines. Each line, with the exception of the final two comprising the payoff, is complete in and of itself. This feature renders the translation formal, maybe even overly wordy; a lot is packed into each. It also compels me to revisit the other poems, retroactively noticing that they, too, share this feature. Why should this characteristic in Seaton’s poem be so obvious while going largely unnoticed by me in the three previous translations? One possible differentiator is the caesura. Plain roads don’t get through to Cold Mountain. Middle of the summer, and the ice still hasn’t melted. Sunrise, and the mist would blind a hidden dragon. So, how could a man like me get here? Seaton employs no hard stops throughout any line in the poem. Four commas regulate reader rhythm to a degree, but they provide barely a hiccup. Arthur Waley uses even fewer commas (two), and nothing else, but Waley uses those commas efficiently, shaking up the conventional syntax. Waley writes, “How, you may ask, did I manage to get here?” (5). Such usage is far from unconventional, but it does provide enough of a deviation, given the brevity of the poem, to shape the whole experience. Gary Snyder places a colon in line two. Though he uses nothing but commas thereafter, the colon is enough of a disruptor, when coupled with the erratic line lengths and rhythms, to characterize the whole poem. Burton Watson uses a question mark in the same position as Snyder’s colon. Though the hard stop is not identical, it serves a similar purpose in shaking up the rhythms of such a short poem. Seaton’s translation, at least in this regard, is fairly unencumbered. But one element Seaton does include that sets his translation apart is italics. As used here, Seaton’s italics increase the dramatic mode by further interacting with (or upon) an auditor. Seaton’s auditor, however, does not have the same relationship to the speaker as does Watson’s. The italics provide the emphatic imperative that there is real tension, not just on the part of the speaker, but perhaps seething from both. Seaton’s “dear sir…” (6), is both overly deferential and sarcastic. One can almost see the speaker bow graciously, acerbically, in the auditor’s direction. Though there is an element of tension, maybe even pain, in each translation, Seaton pushes this element to an aggressive level. Me must, I think, briefly discuss that “dragon” (4). Why it should make an appearance in this poem I cannot say. Of the seven translations I have read of this poem none of the other six so much as hint at a dragon. Is the inclusion here a culturally insensitive method of giving this poem some added Chinese flare? I tend to doubt it. 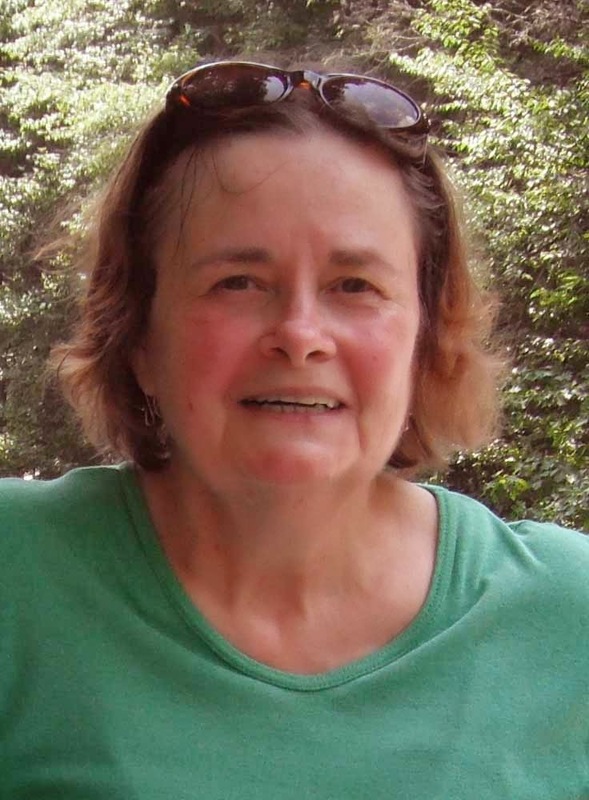 For one thing, such stereotyping is absent from the rest of Seaton’s Cold Mountain Poems; at no other point is a mythical element of Chinese culture exploited to boldly. It’s also important to note that this particular line is, of the five translations included herein, by far the most widely varied. Though the meaning remains the same, more or less, throughout the five versions, the level of creativity with which each translator renders the lines is one of the details that makes comparing these translations so worthwhile. Arthur Waley’s line four reads, “Far into the morning the mists gather thick.” Snyder writes, “The rising sun blurs in swirling fog” (4). No dragon, perhaps, but beautiful, evocative language in their own respects. Individual details aside, what is so enthralling about this particular Han-shan poem that makes it so rife for translation? We can add to those provided here Peter Hobson’s translation, A. S. Kline’s, and countless others. But why, when so many Han-shan poem go relatively unnoticed, should this one stand out? Perhaps because Han-shan’s physical journey to and existence on Cold Mountain is a metaphor for his spiritual journey which, as Joan Quoinglin Tan points out in Han Shan, Chan Buddhism and Gary Snyder’s Ecopoetic Way, “is often seen as a reflection on the ancient Chinese literati’s pilgrimage to Chan enlightenment” (3). Whereas most translators are not Buddhist (Snyder and Red Pine excluded), Han-shan’s journey is vaguely universal in that many people journey toward or away from some form of spirituality throughout their life. Han’shan’s dualistic journey (both physical and spiritual) further enhances the mystery and intrigue of an already attractive character. 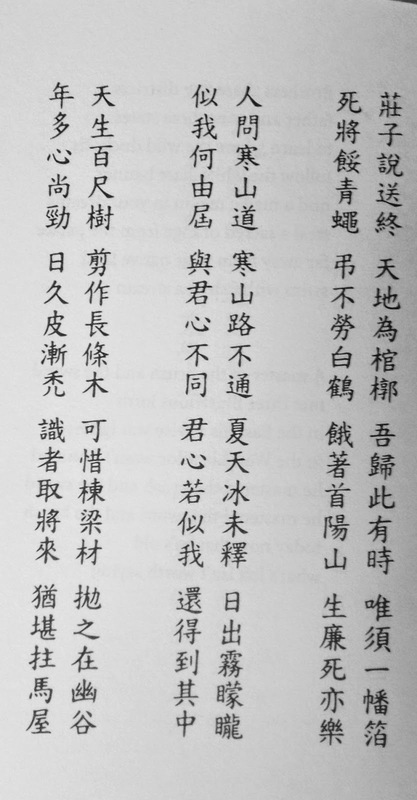 The middle column above is a representation of Han-shan’s original text as reproduced in Red Pine. Red Pine, trans. “16.” The Collected Poems of Cold Mountain. Revised and Expanded. Port Townsend, WA: Copper Canyon Press, 2000. 47. Print. Fan-chih. Boston: Shambhala, 2009. 27. Print. OR: Sussex Academic Press, 2009. Print. Waley, Arthur, trans. “27 Poems by Han-shan.” Encounter 3.3 (1954): 3-8. Print. Watson, Burton, trans. “82.” Cold Mountain: 100 Poems by the T’ang Poet Han-shan. 1962. New York: Columbia UP, 1970. 100. Print. Reviewed by Joel W. Nelson. Shane McCrae was hired to teach for the Spalding University brief-residency MFA program as I was completing my final semester in 2013. During my graduating residency, I was fortunate enough to be a part of a workshop he led along with Greg Pape. McCrae came across as humble, often self-deprecating, guy who is smart, talented, hard working, and an all-around cool guy. To date, McCrae has released three full-length books of poetry: Mule, Blood, and Forgiveness Forgiveness. His fourth book, The Animal Too Big to Kill, is forthcoming from Persea Books. McCrae is a graduate of Harvard Law School and the Iowa University Writers' Workshop. In addition to teaching at Spalding University, he is an assistant professor in the Creative Writing program at Oberlin College. Forgiveness Forgiveness comes at a time when race relations are tense. The case of Michael Brown still looms large in the news, even as the stories of Eric Garner, John Crawford III, and countless others begin to fade. A society assumed by some to be post-racial is proving to be anything but. There are still two Americas. We are still divided, still struggling. We claim to be equals on the one hand, while equality is denied on the other. The narrative is still one-sided, but it is very much in flux. Shane McCrae's third full-length book of poetry, Forgiveness Forgiveness, is a powerful, haunting work that deals with issues of identity, race, family, abuse, belonging, and finding a way to move forward. The poems are mostly unpunctuated, often ungrammatical. Ideas burst forth and crash into each other, as if the speaker is recollecting things for the first time and hasn't had time to filter these thoughts through the conventions of syntax. The effect, in McCrae's hands, is masterful. Although McCrae has made use of similar techniques in previous books, Forgiveness Forgiveness feels even more authentic, personal, and emotionally raw. Forgiveness Forgiveness is structured in two halves separated by “A Pastoral Interlude.” Each half contains three sections, “The Visible Boy,” “Materials Sketch,” and “Draft Epilogue,” with the second half of the book providing alternate versions of the first three sections. In addition to being a racist, the grandfather becomes sexually and physically abusive. The resulting confusion and dissonance caused by this troubling home environment prove to be fertile ground for McCrae's poetry, made even more compelling when considering the dynamic between the speaker's story and that of Little Brown Koko. While the two halves of Forgiveness Forgiveness interact and inform each other, they are not mirror images. The parallels between Little Brown Koko and the speaker are more metaphorical than literal and are understood to speak to--but not necessarily for--a broader community. The poems in the second half of the book are more personal, perhaps even confessional. The early Koko poems are lighter in tone and gradually become darker and more grotesque as the racism becomes more overt and violent. The progression of the second half of the book is generally the opposite. Koko is left ravaged, but the speaker's story is accented by hope. Although a title like Forgiveness Forgiveness might imply a tidy conclusion, the end of the book brings little resolution, at least not of the feel-good type. The speaker moves on with his life. He has a wife and a family of his own, but he never fully makes amends with either of his grandparents. Perhaps such amends are impossible. The final poem in the collection, “Forgiveness Forgiveness,” serves as a suitable but devastating capstone for a truly compelling book of poems. Perhaps caricatures like Little Brown Koko are no longer acceptable in contemporary society--people today prefer news stories, select personal anecdotes, and misleading statistics--yet still, people are stereotyped and placed in a race narrative. Their voices are replaced with another voice, a voice often imposed on them by people who look a lot like me. Forgiveness Forgiveness is a powerful book of poems, not only because of its deep and personal nature or because of McCrae's unique presentation, but because the work speaks to contemporary America. Voices like McCrae's are important. He not only has something to say, but he says it while maintaining artistic integrity with poems of a very high caliber.